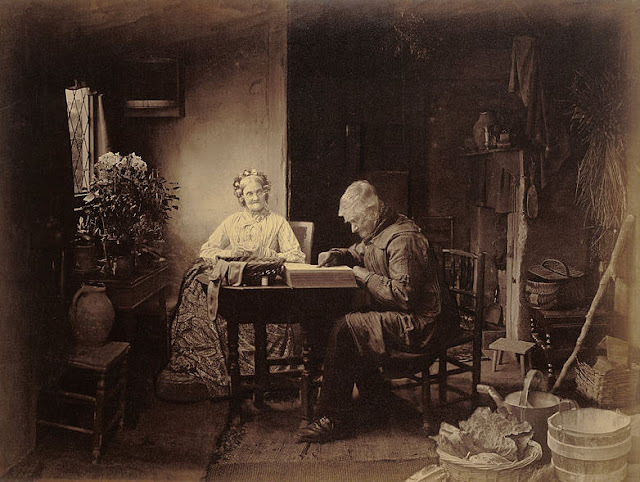 Henry Peach Robinson (1830-1901, English) was a very vocal proponent of photography as a fine art. As others in his time, he started his career as a painter and already at 21 years old, he had one of his paintings exhibited by the Royal Academy. However, the allure of photography proved to be irresistible. He would not be content with just use photography to record a scene but rather seek, in his own works, to "avoid the mean, the bare, the ugly, and to aim to elevate the subject, to avoid awkward forms and to correct the unpicturesque". In that, and in the connection he felt existed between the classics, poetry and photography - as a source for themes and settings -, he shared the standards of academic nineteenth century painting and meant to apply them to the new art form. Robinson wrote many treatises in his lifetime, including Pictorial Effects in Photography: Being Hints on Composition and Chiaroscuro for Photographers, published in 1869, where he used the term "pictorial" in relation to photography for the first time. In his view, the use of techniques such as "combination photography", created by himself - consisting in the combination of separate images into new ones by manipulating the negatives or prints - supported his claim that photography was a "High Art": only through the artist's direct intervention, his/her ingenuity and creativity, the final image came to be. The application of pictorial techniques, such as the chiaroscuro - the use of dramatic lighting and shading to convey an expressive mood - was a powerful tool in the hands of the photographer. 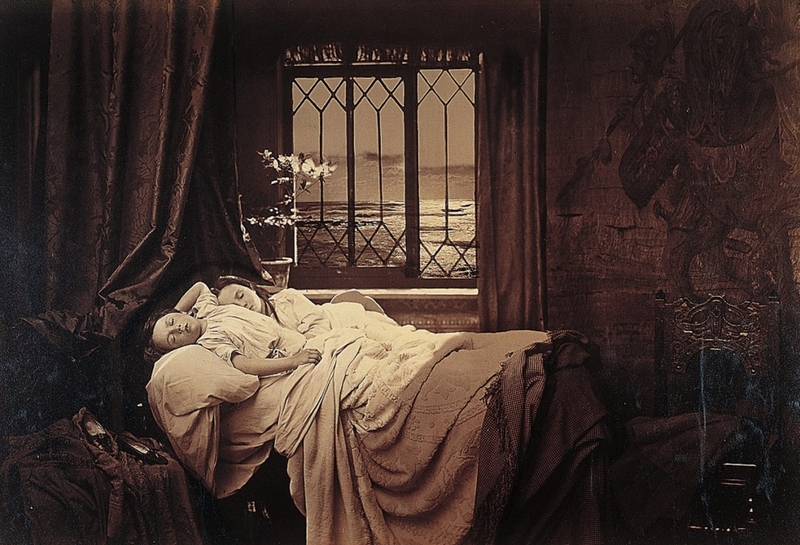 Robinson created some of most remarkable manipulated images in the nineteenth century. His aesthetics were influenced by John Ruskin's, trying to create moments of timeless significance. 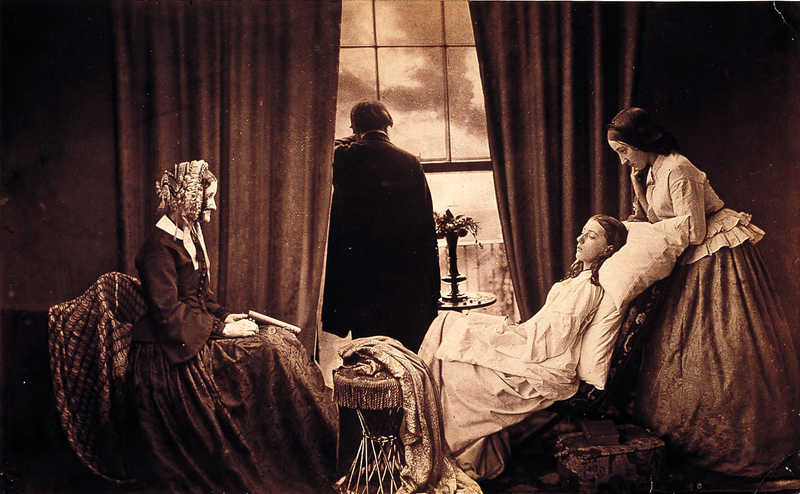 Fading Away, Robinson's most famous image, is a composite print of five negatives. It was called by one critic "an exquisite picture of a painful subject". The model for both She Never Told Her Love and Fading Away is Robinson's favourite, Miss Cundall. 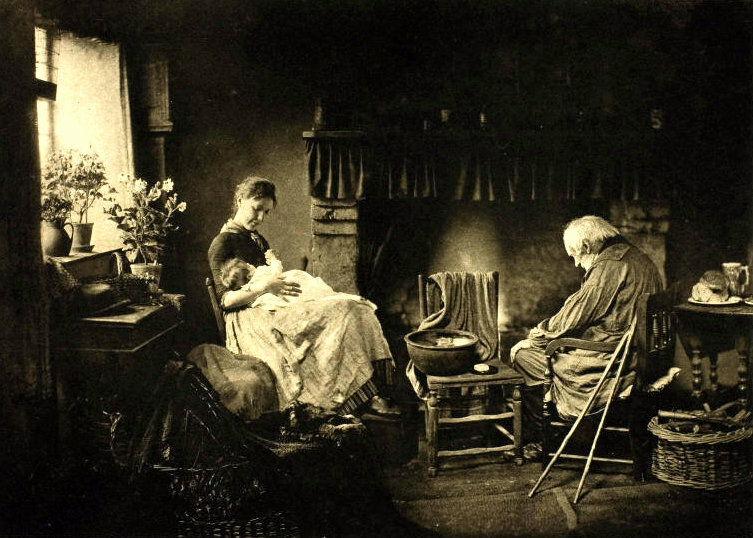 The second, purportedly showing a young consumptive woman surrounded by family in her final moments, was subject to heated debate that, in some ways, continues now. Accusations of indelicacy that are maybe still familiar to the contemporary ear - the invasion of a eminently private moment, that of death - were combined with those of dishonesty - the use of a truthful medium to create a false image - and bandied around the composition. However, there is no difference in amount of "artificiality" between this photograph and any painting representing the same subject, tying both media neatly together as attempts to elevate life to art and transcend the moment. Also, given that tuberculosis was endemic among the urban poor and not so much among the wealthy and well-to-do, the accusation or artificiality can also be levelled at Victorian art in general. Searching to elevate the subject, Victorians altered reality - inexcusably, from the point of realism - as they refused to depict what surrounded most people living in industrial-revolution England: squalor, but then that would have been considered even more indelicate. 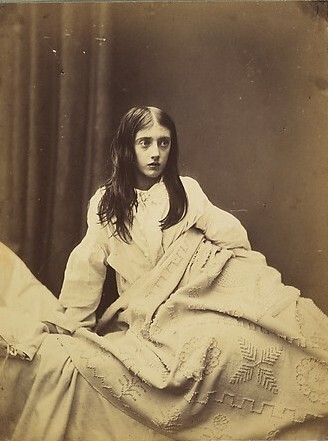 In any case, the picture received royal approval in that Prince Albert not only bought a copy of Fading Away, but also ordered every composite print Robinson created afterwards. 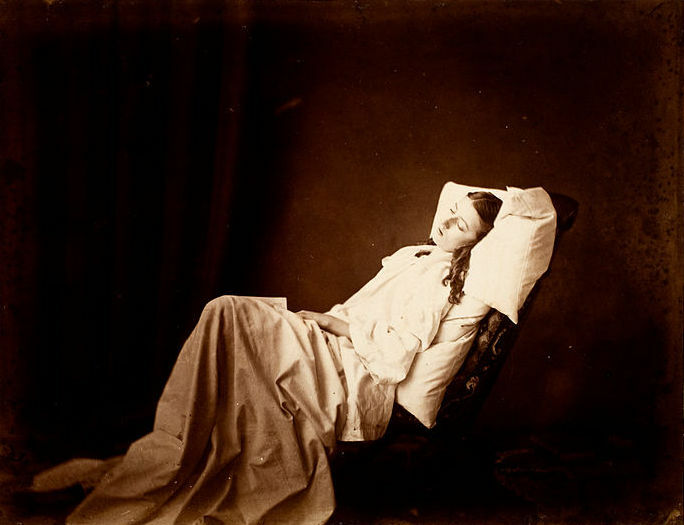 Henry Peach Robinson, Sleep, 1867, albumen print. Robinson used as inspiration a poem by Matthew Arnold, Haworth Chrurchyard, 1855 (Sleep, O cluster of friends,/ Sleep! or only, when May,/ Brought by the West Wind, returns/ Back to your natives heaths,/ And the plover is heard on the moors,/ Yearly awake, to behold/ The opening summer, the sky,/ The shining moorland; to hear/ The drowsy bee, as of old,/ Hum o'ver the thyme, the grouse/ Call from the heather in bloom:/ Sleep, or only for this/ Break your united repose). Some paragraphs in the poem refer to Charlotte Brontë and Harriet Martineau, while others at the Brontë siblings. [Source: Better Photography]. George Eastman House 1000 Photo Icons, p 358-60. Taschen, 2002. Henry Peach Robinson, the Pictorialist, by R. Lalwany.